You guys are going to love this tutorial, until the end. You may remember this chest of drawers from a couple of months ago. 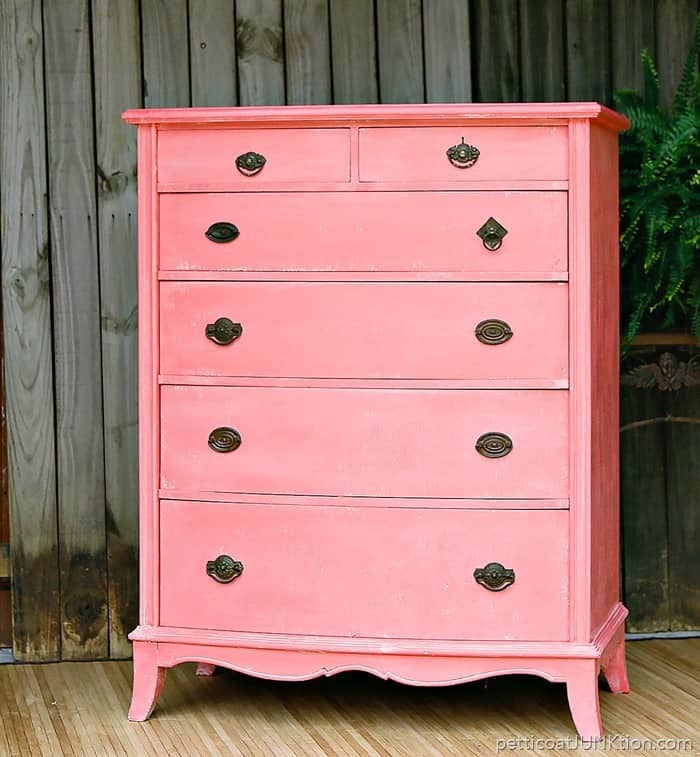 I painted it for our DIY Furniture Girls “Coastal” theme . 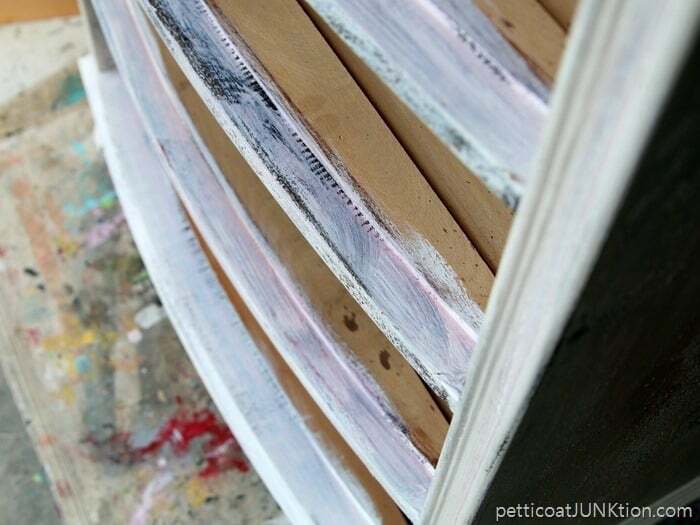 I tend to think shades of blue for coastal furniture and I was going to paint this piece a beautiful shade of blue. Then something happened. 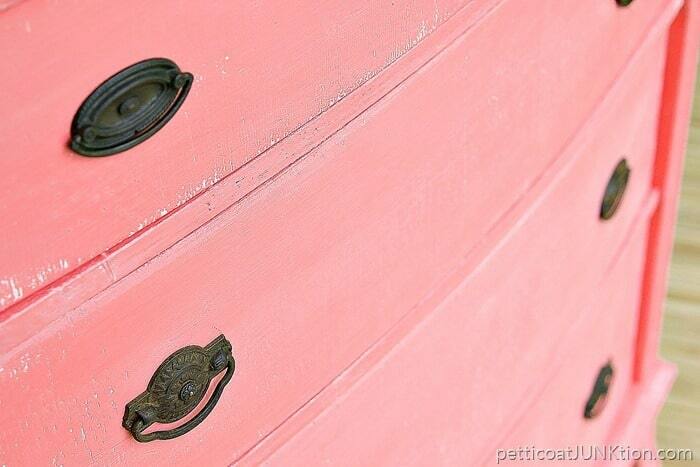 Above is the before photo of the beautiful chest of drawers I started with. ( I’m a Leg Girl ) Well, it was a beauty at one time. I asked you guys about painting or staining it. 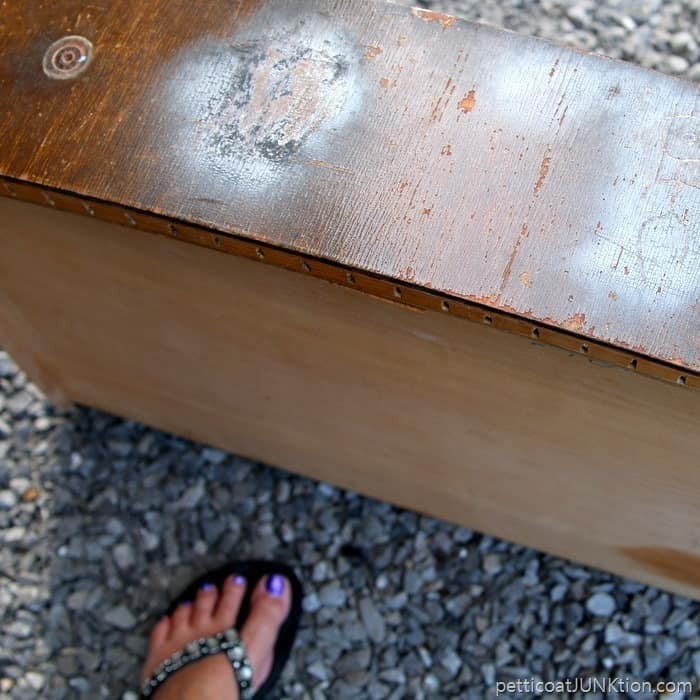 Most of you were for trying to refinish the chest to it’s original beauty. I was all for that too but didn’t know exactly how I would accomplish it. Remember, I’m lazy. 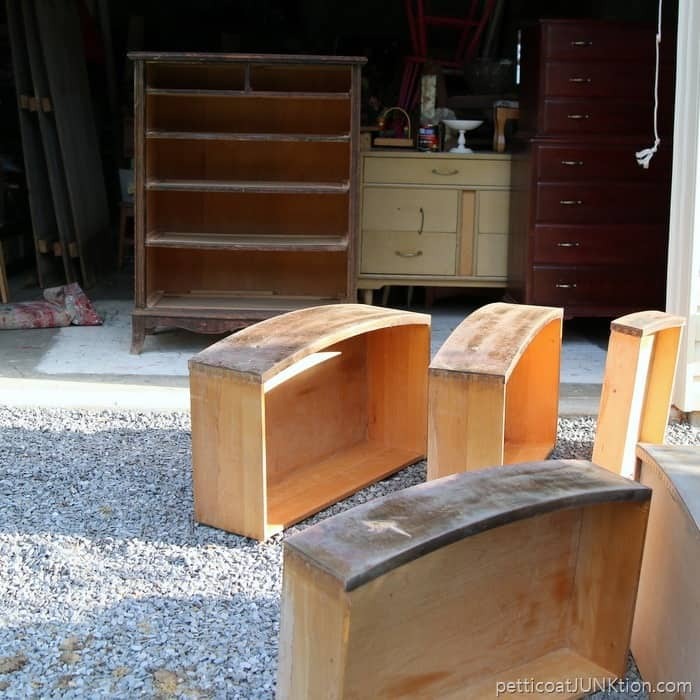 The chest had all sorts of issues, like missing veneer….and wood. More spray painted areas and alligatoring of the original finish. I tried sanding and it didn’t really help. That’s when I decided to just go with paint. I primed first with Glidden Gripper primer. Can you see all that pinkish bleed through? I always thought bleed through was caused by the original stained finish but when this happened I started doing research. 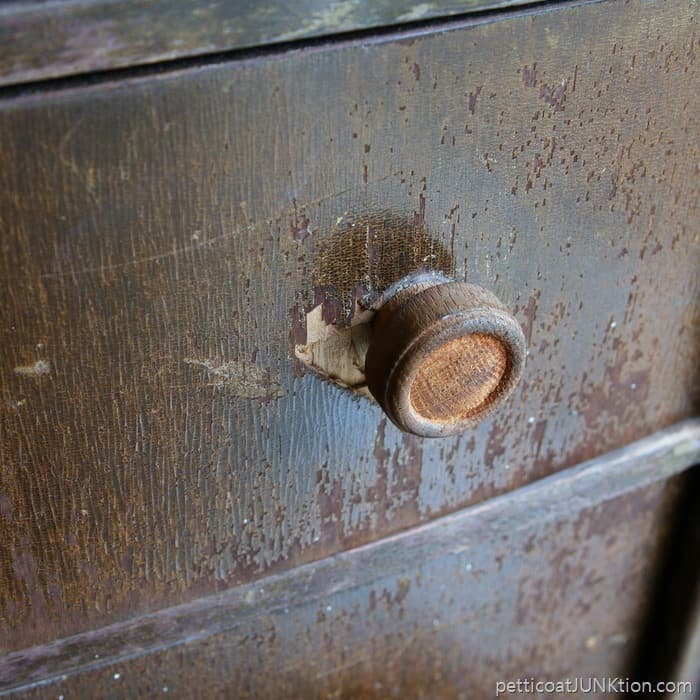 Bleed through is actually caused by substances in the wood. 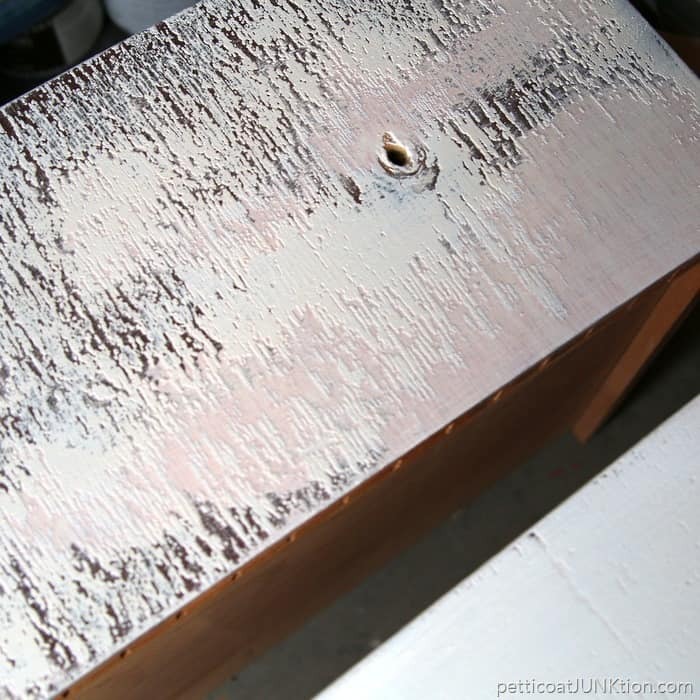 You see in the photo above that the bleed through is coming from the raw wood areas…..not the stained areas. Learn something new every day. I tried putting on a second coat of primer and still got this. The problem was easy to solve. 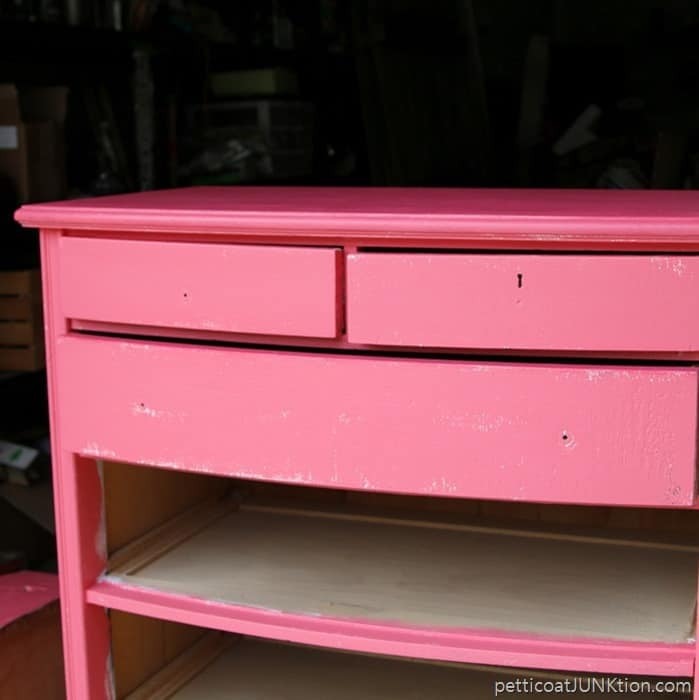 Go with a pinkish paint….tadah! 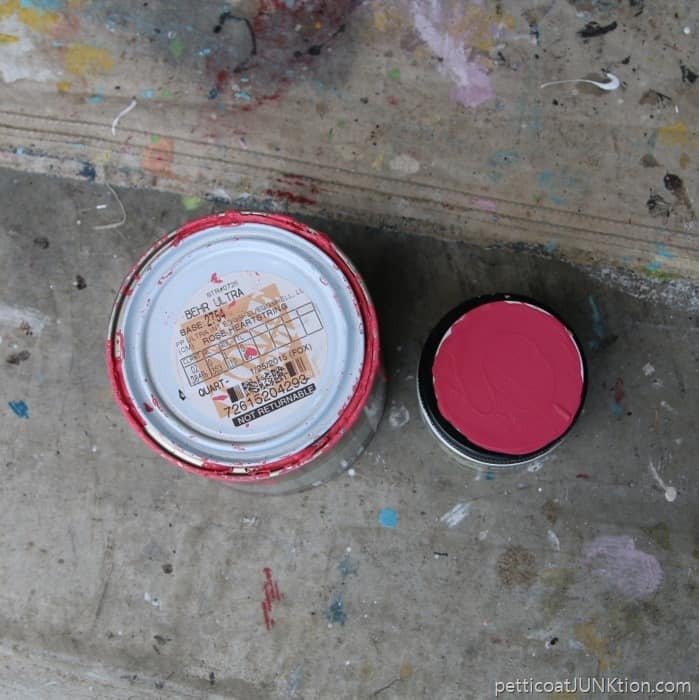 I used the paint on the left…Rose Heartstring (Glidden color mixed in Behr paint) on a custom nursery piece and the color is beautiful. I didn’t have much of it left though so I pulled the sample on the right from my stash as a backup. If there was bleed through it wasn’t noticeable. Now this is the part at the end where you might go “really Kathy”. I didn’t get any photos of the white-washing. But I can tell you about it. Just mix a little white paint, doesn’t matter what kind, with water. Make it really, really thin. Brush it on, yes it’s going to be really runny. Then wipe it off with a rag. If it’s too white wipe it off with a damp rag. 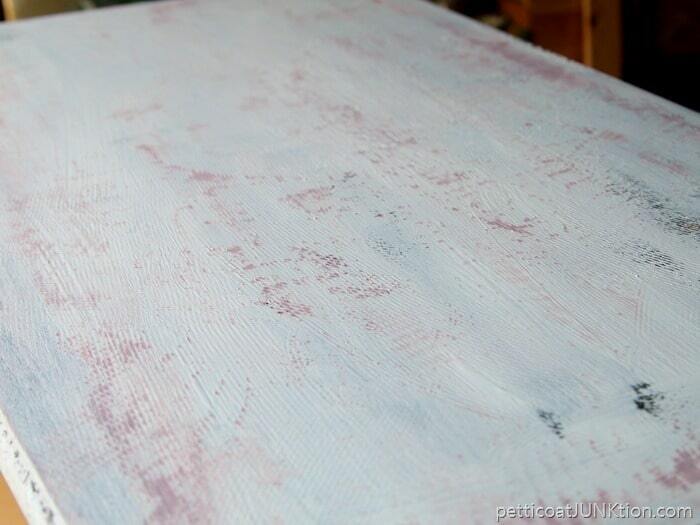 If it’s too light then go over it again or mix a little more white paint in the water. It doesn’t take much at all. Then just let it dry. The Rose Heartstring is a little pinkish/coral and the white wash made it more of a coral paint color. I had just enough of the paint to finish the chest but I was scraping the bottom of the can before I finished. The hardware on the chest was all wood and mixed and matched. I painted it white and started putting it back on but the effect was not good. I dug through my hardware stash and found my own mix and match vintage hardware. Awesome. What do you think? Leave me a note. See you next week! It’s gorgeous!! What a great way to solve that bleed thru problem! The only thing I’ve found to stop it is shellac, and even that doesn’t stop it every time. As always, you knocked it out of the park. I think I wish you lived next door. It turned out really well, Kathy. I’ve never decorated with coral but I like it on the dresser. 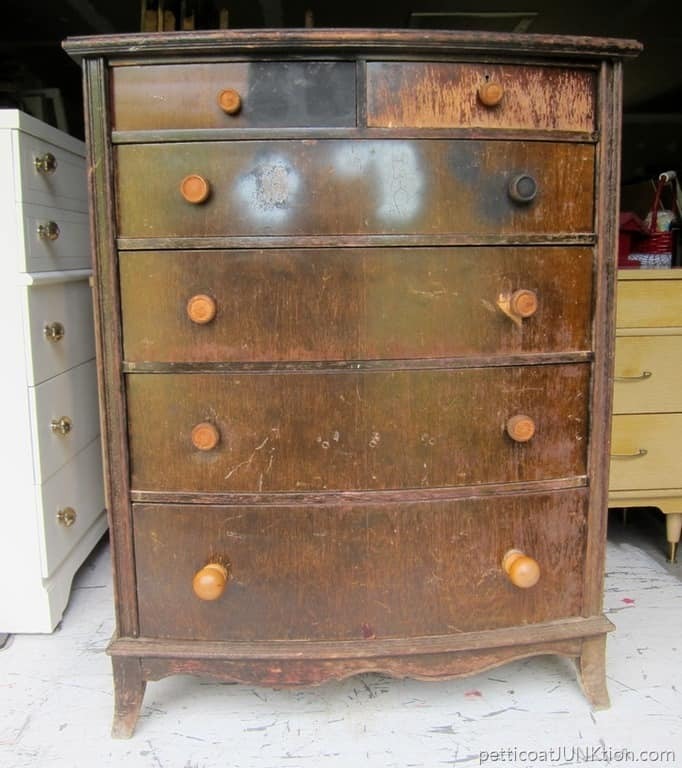 What I really like about the dresser is the curved shape of the front and the lovely little legs. It just has a very nice silhouette. Someone will come along and it will be just exactly what they are looking for. Very informative post. I had never heard of bleedthrough. Oh, and I like your choice of drawer pulls. Much better than the boring old wooden ones! I love the way it turned out, simply beautiful. U love the coral color. It will be a great accent in a beachy blue/green setting. I’m not normally a pinky person, but this turned out terrific. The hardware was the icing on a pretty coral cake. Great job! Love this! You are so creative! Wish I could get up the courage to paint some of my wood stuff – I know – it’s just paint – but once I go there – the original finish is history. Need to buy something at thrift shop to try out rather than using something with sentimental feelings attached to it. Love the coral!! 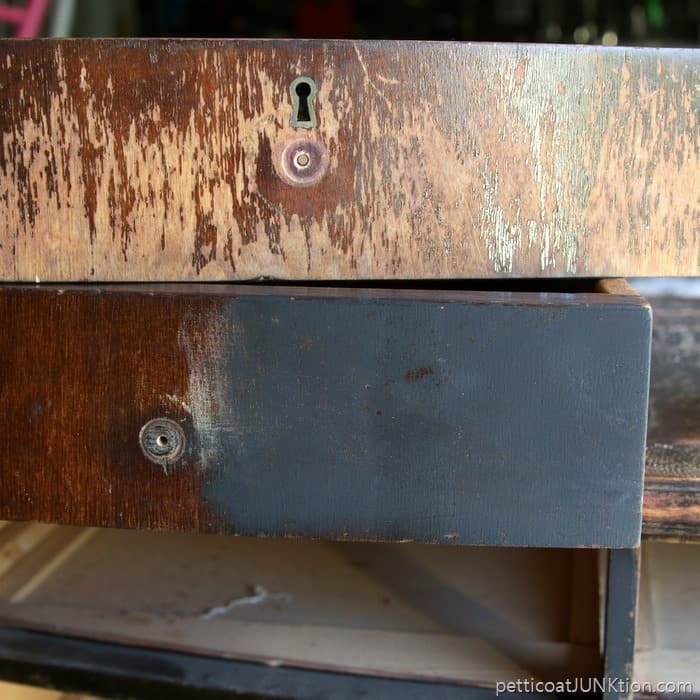 That bureau was definitely too far gone to restore IMHO. Have you tried spray shellac to stop the bleed thru? The hardware is killer. Well done! Kathy, I love the color on this piece! It’s beautiful & I love the hardware! Great job! It turned out really nice. Paint was definitely the answer for this piece. Thanks for sharing! I love the way you make things work, don’t overthink things, and use your ingenuity! Thanks for inspiring me! Looks like you made a wise choice with the coral. It is beautiful. I love the coral and think it was a great choice! I’ve experienced bleed through on certain pieces too. Who knew it was the wood? I always thought it was the old finish. So glad to have discovered your sweet blog. I’ll be back!